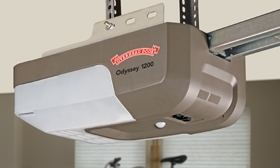 The Odyssey® 1200 screw drive garage door opener features a patented direct drive system. It has all the lifting force needed to raise sectional doors up to 14 ft. high or one-piece doors up to 8 ft. high. Enjoy the convenience of a maximum opening speed of up to 10 inches per second.